There's nothing like the hands-on creative experience of finger painting--it's no wonder kids love it! And with this set of eco-friendly paints that you mix up yourself, you'll know that your little artist's palette is perfectly safe. It includes 5 resealable pouches, each containing all-natural gluten free powders to mix up beautiful colors: blue, green, orange, magenta, and yellow. The veggie and fruit extracts that give each powder its color are just as vibrant as the artificial dyes found in many other paints, and the powders allow you to mix up just enough for each masterpiece--no more wasted paint and dried out supplies. Handmade by Cammie Weeks in the USA. Mix paint as needed. Reserve unused powder in resealable pouches. I loved the concept and it cleans up so easily, but it dries so light on the paper and leaves gritty particles. I'm not sure how practical it is after all. We bought these paints for my one year old son's first Christmas and he LOVED playing with them. They're totally natural and plant based, so there was no fear when it ended up (inevitably) in his mouth. They were easy to mix too! My sons have so much fun with these paints! I love that I can mix how much I want whenever I want and the ratio of 1:1 is so simple! We used this product for the first time yesterday. We went to a park with my toddler to avoid mess at home. I really wanted to love these paints, and when my child ate the paint, I was glad for them! However, the colors were more muted than I anticipated, and the paint had a bit of a grainy texture. Also, if you are going to use outdoors, I recommend mixing up the paint indoors before you go - the wind blew the powder out of the dishes while we mixed outside. They're easy to use and the powder format makes it easy to store and clean. I feel good about allowing my 1 year old to play with these because they are natural. She has so much fun and it creates beautiful artwork. We did not use the product, but watched a video of our godson enjoying it. The paint looked beautiful, and he clearly had a blast! Purchased this paint for my one year old great nephews. Nice colours and great that you only mix what you need. The boys will be able to create many masterpieces. 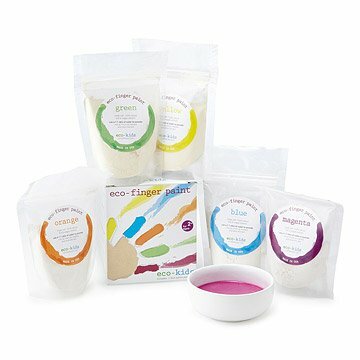 These finger paint powders are all natural and allow you to mix up just the right amount.